My daughter is off visiting her grandparents in Massachusetts for a few days, and I'm managing my severe toddler cuddles and kisses deprivation by taking a little sewcation for myself each night when I get home from work. It is kind of amazing how much sewing you can get done when you don't have to start at 11:30 p.m. and stop at midnight each night... and when you can actually leave out the ironing board, sewing table and cutting mats! 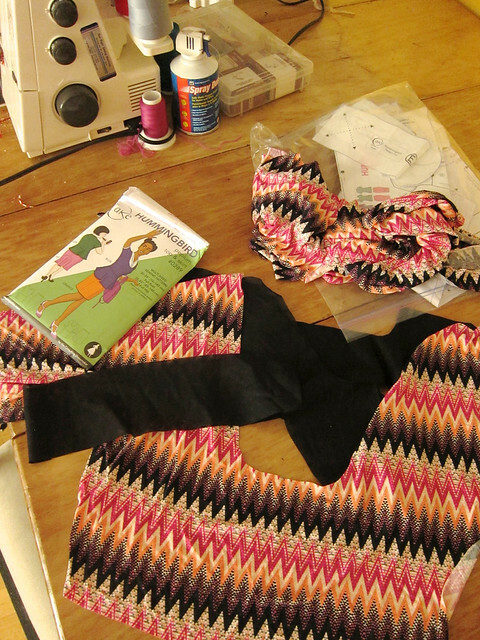 Above you see two separate items in progress: the bodice of my Tiramisu dress so far (finally! I made the muslin back in May!) 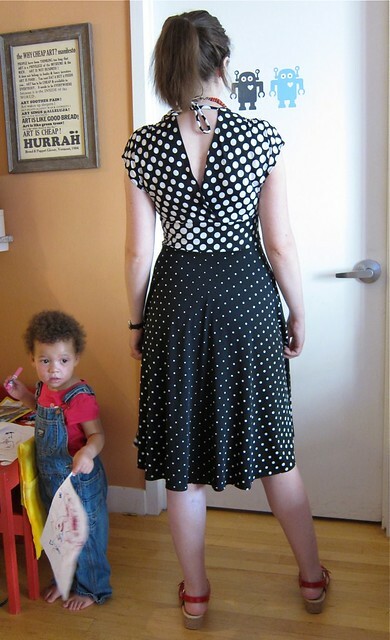 and a self-drafted "Insta Skirt". I picked a smaller bodice size this time (30D with a 1" FBA, instead of a straight 35D) and she is fitting great so far! I should have the skirt attached tonight. (And I know she doesn't fit my crappy sewing form at all, so just trust me on this). 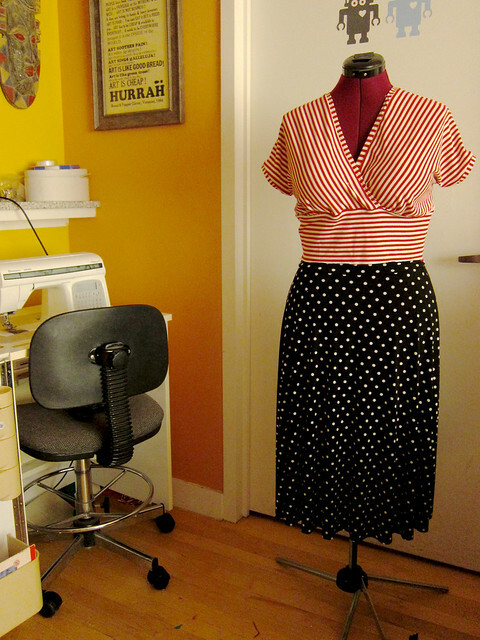 I've always wished I could wear the bottom bit as a separate skirt, and it took me only about 15 minutes to sew (just two sides seams and an elastic-free knit waistband—magic!). FIFTEEN MINUTES FOR A SKIRT, PEOPLE. ...But it's not REALLY an Insta Skirt, because my serger temporarily crapped out on me for three hours of swearing and rethreading and crying... and now that the skirt has hung for a day it has grown by four inches and needs a severe hemming. 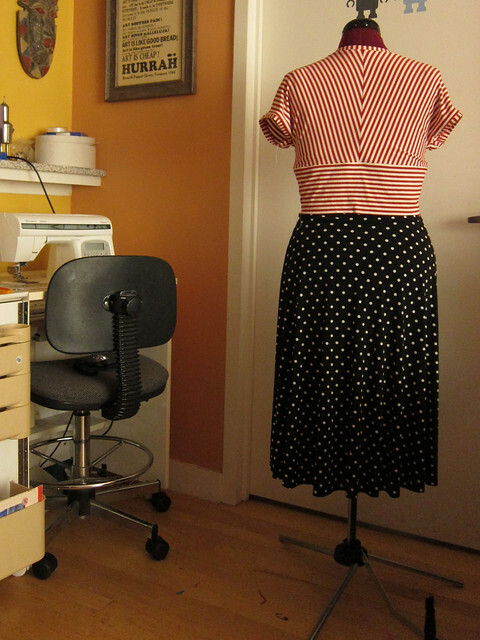 Having no clue how to evenly hem a half-circle skirt, I suspect there is some online tutorial hunting in my future. 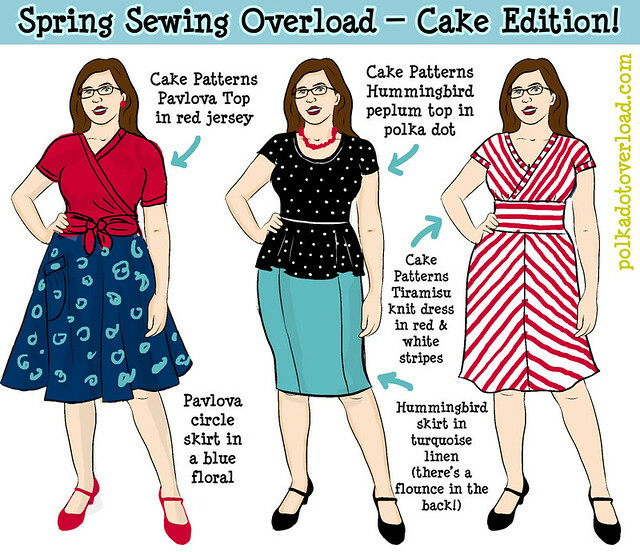 Finally, I have my Hummingbird Blue top pieces sitting around since the sew-along, since I was too busy moderating to actually make anything! I think this little sewcation may almost be as fun as splashing around on the beach, and I'm getting 100% less sunburned as a result! (But I am also counting the seconds til I get to cover little Z in kisses ... on Friday!). So readers: When was the last time you really got to sew (and leave all your sewing mess all over the place) with no interruption? ha! well, I'm getting there. The night she got back was pure bliss, she just hugged and kissed me all over my face for HOURS and insisted I cosleep with her so she could just wake up repeatedly to say "I love you Mommy, I missed you so much!" I second K.Line's comments. My daughter leaves for camp on Sat. morning and I have a week-long sewcation planned. It's nice to have the peace and quiet just to be able to sew. I love my kids, but I am so glad there adults now. It looks like your getting quite a bit done on you kidcation. Enjoy! Honestly, with my kids' food allergies, I'd be afraid of leaving them at their grandparents! LOL. I am lucky to be living in a semi-rural area and thus can afford a house with an extra bedroom for all my crafty stuff (housing dollar goes pretty far in rural MN). The no-interruption time, though, that's just the stuff of dreams for me. This sounds so awesome!! I always miss my kiddies after the second day, but until then it's great fun!! I love the projects you've featured here! Especially the skirt. 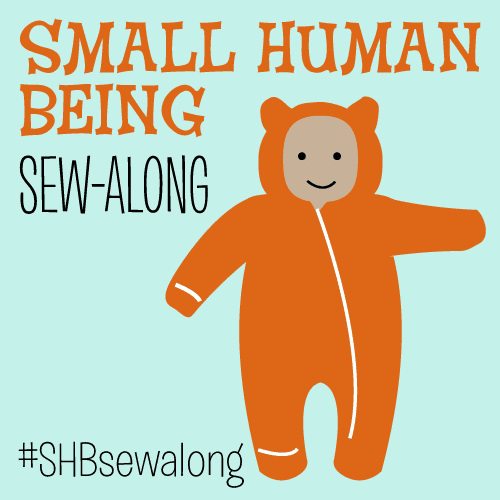 Sewing without interruption? That hasn't happened in a while. Luckily with The Hubby's work schedule he's sometimes able to take the two kiddos for the day while I attempt to get into a sewing frame of mind. However, I'm very lucky to have a dedicated sewing room so I don't have to clean up after every sewing stint. The kids are at an age where they still prefer sharing a room (3 and 5), so that third bedroom is mine, ALL MINE! Ooh, a third bedroom? That's nearly like a unicorn in NYC... I know they exist but have never seen one! I'm actually not sure what people do if their kids don't want to share a room... make one sleep on the livingroom couch? split the bedroom into two mini bedrooms? About the sharing bedroom thing, I grew up in a tiny house and a big family, and for a couple years my little brother did sleep on the couch. I always felt very bad for him. After the two eldest moved out he got his own room while I shared a 10'x10' bedroom with my two sisters.